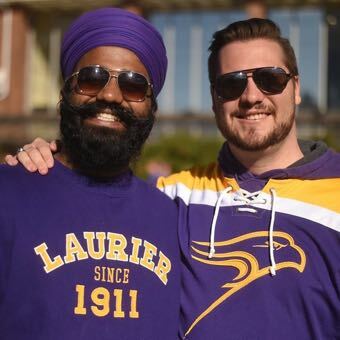 Waterloo – Family, friends, food and football are bringing alumni back to Wilfrid Laurier University’s Waterloo campus Sept. 28-30 to create new memories in the place where they spent their formative years. For Laurence Hewick (BBA ’68), this year marks the 50th anniversary of his graduation. His class photo has been on the wall above his desk since then. The good nature of Homecoming weekend starts early with the free pancake breakfast on Saturday morning. Known as the place to be before the football game, this year’s breakfast serves up pancakes with bacon, sides and a toppings bar. Participants can play lawn games, such as giant Connect Four and giant Jenga, and enjoy music by DJ Junaid Ali — also a Laurier alumnus. Face painting and prize giveaways complete the family atmosphere. At the football game on Saturday at 1 p.m., the Laurier Golden Hawks’ return road to the Yates Cup sees them take on the Guelph Gryphons in the Battle of Highway 7. Some tickets will be made available on game day, with one of the stadium’s endzones reserved for alumni. Hewick said the campus tours should be fascinating for alumni who have been away. He remembers the area around University and King Streets as a field where cows grazed. He watched it change, staying close to Laurier after graduation. Hewick became a professor here and returned for Homecoming “many times in the ’70s and ’80s.” He was named Alumnus of the Year in 1984, and when his career took him around the world, Hewick missed some of the celebrations. Hewick will have that opportunity at Homecoming weekend’s hallmark event, the Forever Purple and Gold Dinner and Dance at the Inn of Waterloo, for graduates from the 1960s and celebrates the class of ’68. For registration and details, visit LaurierAlumni.ca/Homecoming. Laurier’s Brantford campus celebrated Homecoming on Sept. 22.